June 2, 2017, Baku – The logo, corporate style and livery of BUTA AIRWAYS, the first low-cost airline of Azerbaijan, were created by preserving national coloring. The logo of Buta Airways reflects the symbolism of the mythological sacred bird Simurg, represented in the form of the Azerbaijani ornament buta. On the airline’s bright livery, buta patterns are drawn in the corporate blue color of the CJSC Azerbaijan Airlines (BUTA AIRWAYS is a structural unit of CJSC AZAL) and also in a bright red color that refers to Azerbaijan’s flag. 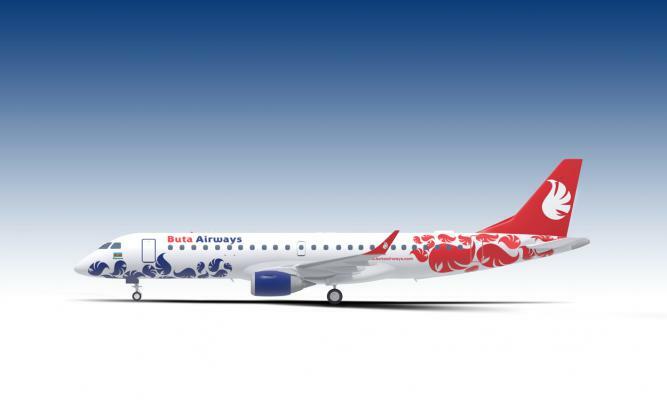 The fleet of BUTA AIRWAYS will consist of modern Embraer aircrafts. Currently, the development of the airline's pricing policy, transportation rules, as well as the route network is at the final stage. In the near future, the public will be provided with detailed information about it. The launch of the airline's website, through which it will be possible to purchase flight tickets, expected soon. Flight tickets can also be purchased at the sales offices and in official agencies.